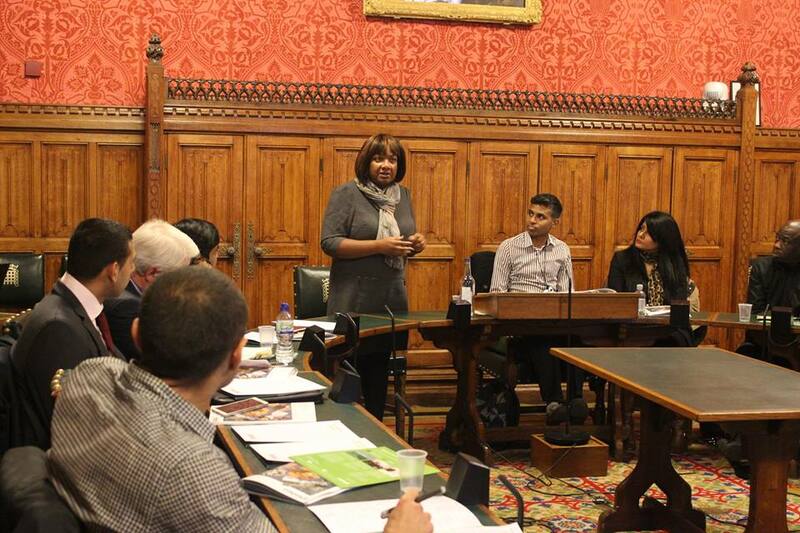 UAF and Mend held a joint event to discuss how to combat the rise in Islamophobia in Parliament. The event was hosted by Diane Abbott MP and featured Muslim community groups. It was part of the annual Islamophobia Awareness Month programme of events in November. This Thursday’s round table featured an in depth analysis of the concerning rise in Islamophobia and identified key areas where Government should make improvements if it is to be effectively challenged. Diane Abbott MP highlighted how Islamophobia has reinforced and increased racism and outlined how the past decade has seen the mainstream media attack Muslims and migrants. Diane exposed the so-called debate of UKIP, which claims to talk about Europe but is actually a code for immigration, which in turn impacts on non-migrant settled black communities. She said that the debate ends up benefiting the far right because if people have been convinced that immigration is the problem, you cant move far right enough for them. Diane called for all communities to stand together and be united in the face of the rising racism and Islamophobia. Sufyan Ismail, CEO of MEND gave an overview on Islamophobia, outlining that even in a diverse city like London, Islamophobic hate crimes have spiked, with over 500 incidents of hate crime, where women are often targeted. It is still not possible to get a full national picture of Islamophobic hate crimes due to the lack of police recording. However, around a quarter of police forces have responded positively Mend’s manifesto pledge to record Islamophobia as a separate category of crime with a further number of forces agreeing to record Islamophobia. Sufyan presented the results from different regions, including the North West, where Muslim communities are 5.1% of the population but Islamophobic hate crimes are 54% of faith based hate crimes. He concluded on the importance of Parliamentary action to protect the Muslim community, enhanced sentencing on Islamophobic hate crime to act as a deterrent, and education amongst young people about Islamophobia. Muslim voters as a proportion of the swing needed to secure marginal seats identified by Conservative and Labour in their 2015 electoral strategy demonstrates the importance of mobilising Muslim voters’ potential. The meeting heard a moving speech from Maz Saleem, the daughter of Mohammed Saleem, an 82 year old man who was murdered in Birmingham just yards from his house by a Ukranian fascist. Maz said that her father was murdered for simply being a Muslim. His killer was able to target three mosques with bombs whilst he was still at large. Maz described how she is continuing to campaign against Islamophobia despite the horrific loss her family has had to endure. Talha Ahmad, National Council member of the Muslim Council of Britain highlighted the example of the Trojan Horse hysteria that had been whipped up by the media, and demonstrated the importance of the Muslim community standing up to this in the political process, including calling on Birmingham MPs to represent their constituents by challenging the media frenzy. He criticised governments policies which have singled out and stigmatised the Muslim community, which can only have a negative impact against a backdrop of ongoing Islamophobia. He described how the MCB has faced demonisation for standing up on important issues for the community and called on politicians to ensure no one is excluded from the political process because of their faith. Hugh Lanning, Vice Chair of Unite Against Fascism reminded us of the trade union principal ‘an injury to one is an injury to all’, which should apply to all communities facing racism and Islamophobia. He talked about the double standards of singling out Islam and the Muslim community in the discussion about religious extremism. He said that Islamophobia would be a central part of the UN Anti-racism day demonstration on March 21st and that the effort to combat Islamophobia was strengthened by our diverse society. Dr. Mark Walters, Senior Law Lecturer at Sussex University outlined the impact of Islamophobic hate crimes, with Muslim adults being victims more than any others in both religious and racist hate crimes. This has resulted in a climate of intimidation where women remove their veils, men shave their beards and Muslims hide their religious beliefs. Dr. Walters outlined that the negative impact of these attacks has created a climate in which the victims are motivated to seek justice following such attacks. Dr Omar Khan Director Runnymede Trust outlined how the Trust challenges racism and Islamophobia, and said that over 106 racist murders have taken place since Stephen Lawrence died. He highlighted the importance of raising awareness within the Muslim community about the importance of registering to vote, as many people will not be aware of the need to register and therefore could be cut out of the democratic process. In the forthcoming general election and its outcome, voter engagement and participation could make a difference if communities are mobilised. Mohammed Kozbar, Vice President of Muslim Association of Britain and Chair of Finsbury Park Mosque described how incidents threatening the Muslim community were not categorised as Islamophobic hate crimes by the police. That Government and Parliament had to take responsibility for this. He said that the failure to legislate against Islamophobia meant that Muslim communties were not protected from hate crimes. Weyman Bennett, Joint National Secretary of Unite Against Fascism said that the campaigns run by UAF had defeated far right groups such as the BNP and the EDL that target the Muslim community. UAF has consistently worked with the Muslim community in its campaigning work which is strengthened and made more effective by the broad, diverse alliances that it brings together. UAF will be active in the forthcoming months with events and initiatives aimed at challenging those who promote racism, fascism and Islamophobia in politics and in the media. The meeting identified the importance of strengthening legislation against Islamophobia, that police reporting of Islamophobic hate crime must happen in every region in order to build a national picture and promoted the UAF national conference on 21 Feb and the UN Anti Racism Day demonstration on 21 March as national initiatives to oppose Islamophobia. This entry was posted in Featured resistance, Resisting Islamophobia, UK by Bob Pitt. Bookmark the permalink.